Email deliverability is a big issue for any business owner or online marketer who is using email as a marketing channel. It’s important to understand “email deliverability” in context of the other email marketing metrics. Email deliverability is the first line of defense when it comes to getting your subscribers to open your email messages and take the desired action. In other words, if the email message is not delivered in the first place, inbox vs. junk folder placement is a non-issue nor is whether or not they open the message, read it, or click on a link inside of the email message. So, before we can look at any of the other metrics to help judge the effectiveness of your email marketing, we need to look at email deliverability best practices. These 10 email deliverability best practices will help ensure that your messages don’t get turned away by the ISPs before they reach your subscriber. 1. Email Authentication – this is really just a fancy way of saying “to prove that the email is coming from the person or entity that it says it is”. There are a number of methods used to authenticate a Sender’s domain including SPF, SenderID, DKIM (domainkeys identified mail), domainkeys, and more recently DMARC (domain-based message authentication reporting). It is important that these are in place and set up properly. NOTE: Even if you are using an email service provider to send your messages, you may still need to update your SPF records for the sending domain (i.e. the from email domain). 2. List Hygiene. List hygiene is, perhaps, one of the most important email deliverability bet practices to pay attention to after proper email authentication. List hygiene is also something you have total control over whether you are hosting your own email client or using a 3rd party provider (ESP). 3. Register for Feedback Loops. If you are hosting your own email program, you’ll have to register for feedback loops manually for each of the ISPs. If you’re using and email service provider, they will handle removing subscribers from your list who click the “spam” button. However, it’s not enough to just remove complainers from your list. You should also be monitoring your complaints. Which types of messages generate the highest complaints? 4. Be Consistent. This is area that is most overlooked. Yet, it goes hand in hand with email deliverability best practice #2 and #3. If you send to your list sporadically, you’ll have higher numbers of unknown recipients as people change their email addresses fairly regularly and turnover is pretty substantial. In addition, if your subscribers haven’t heard from you in 3 months, they’re more likely to hit the spam button because they either don’t remember signing up for your list or are no longer interested in the messages. 5. Pay Attention to Engagement. Engagement metrics are essential when it comes to email deliverability and this one issue is going to play a larger role in the future. It’s not about the size of your list, but rather the quality of your list. For any subscribers that haven’t taken some sort of action in the last 3-6 months, consider sending your campaigns from a different IP address AND instituting a re-engagement plan for those subscribers. Keep your most active subscribers separate to ensure the highest email deliverability rates (and highest inbox placement rates). 6. Check Your Domains. There are 3 main reasons messages get blocked before they ever get to your subscribers. These include: IP-reputation issues, message content, and blacklisted domains. Unfortunately, most email marketers don’t know that domains in the email messages can be causing blocks. And if you’re using an ESP, they virtually never tell you. So… it’s important to pay careful attention to every domain in the message and check each of them against known blacklists prior to sending. 7. Check Your Content. As the saying goes… Content is king! And ultimately your content is going to impact your delivery rates. Run your messages through a spam checker or some sort prior to sending your messages out. One thing to note is that while there are all kinds of claims that words like “free” and “money” will cause your messages to get blocked (or wind up in the spam folder), it’s not so cut and dry. The big lesson here is to write for your audience. Don’t try to “trick” the spam filters or be sneaky! Often times, there’s a real person at the other end of your email messages and if it looks like spam and smells like spam, they’re going to mark it as spam and either send it to the junk folder or reject it entirely. A Simple Test: Pretend that you received the email message in your inbox. Would you think it looks like spam? Would you read it? Delete it? Mark it as spam? 8. Include HTML and Plain Text Versions of Your Messages. While this is more of a usability issue, we still want to include this as an email deliverability best practice because HTML can cause a number of issues when it comes to sending your messages. Think about how web pages look different in different browsers (Internet Explorer, Firefox, Safari, Chrome, etc.). Well, in addition to all of the browsers, there are dozens, if not hundreds of email clients, each with a slightly different method of handling HTML email. So, if you are going to use HTML email, be sure that it is formatted properly and that you also include a plain text version of your email. 9. Comply with the Can-Spam Laws. Can spam compliance is very simple, yet too many online marketers/business owners simply don’t do it. To comply with can-spam, you must not use misleading header information or misleading subject lines. You must include your company contact info and a method for people to unsubscribe. And you must honor all unsubscribe requests within 10 days. It’s a good idea to review the can-spam law. Not only is it an email deliverability best practice… it’s also the law! 10. Develop A Process for Managing Bounces. There are essentially 3 types of bounces: hard bounces, soft bounces, and technical bounces. You should have a process in place for managing each of these bounce types that ensures you are keeping valid subscribers and removing those that are not. Bonus Email Deliverability Best Practice Tip: Use Confirmed Optin. While this may not be practical or make sense in all cases, it’s by far one of the email deliverability practices that all of the ISPs agree on. The Reason? It ensures that people that are receiving your messages truly want to receive your messages. They’ve taken the extra step to tell you that they DO, in fact, want to receive your emails. This information has been provided by http://www.EmailDelivered.com and written by Heather Seitz. 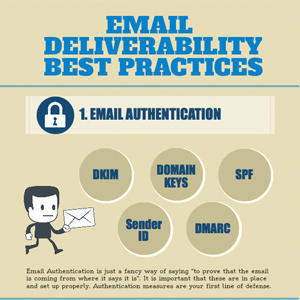 To find out more about Email Deliverability Best Practices , visit http://www.emaildelivered.com/email-deliverability/email-deliverability-best-practices-2/. Don’t forget to sign up for the EmailDelivered Pulse newsletter for articles, tips, and recommended resources related to email marketing and email deliverability.